In a world where people grew up watching Steven Spielberg-movies as a kid, and playing video games as teens, and then got into making movies as young adults… is actually where we live. 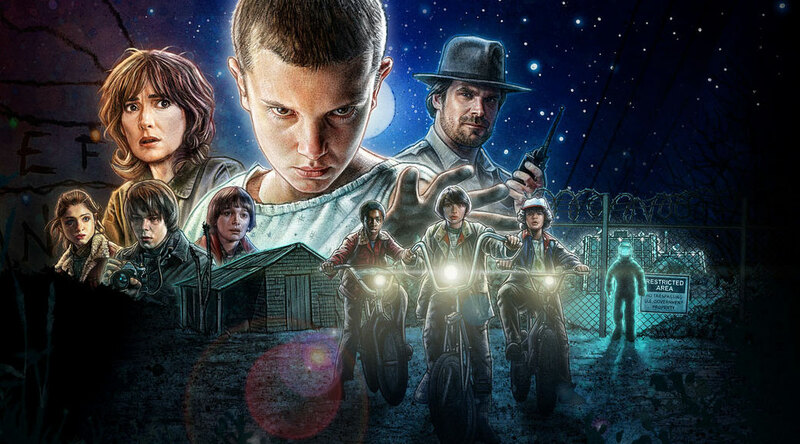 Stranger Things is a love-child of E.T., Silent Hill and 80’s nostalgia, all presented in a beautiful package on your Netflix-viewing device of choice. The look and feel of mystery-movies from days gone by (the good ones, where the monster isn’t revealed in the first 15 minutes) where the unknown creates the suspense that you want with a drip-feed of supernatural and conspiracy tells you the history of how we got to where we are right now in the story. The show follows a group of kids that enjoy their time in the basement playing Dungeons & Dragons until it’s time to bike home. No video games, no smartphones, no Internet; this is the time before the digital revolution. Then one of them goes missing, without a trace, followed by the appearance of a strange young girl that joins them on their adventure to find their friend. But my favorite character is portrayed by David Harbour as Chief Hopper, the police officer that looks into the kids disappearance and soon discovers that not everything is what it might seem in his sleepy little town. The heritage of the show is captured magnificently in the music and intro, using sounds and instruments that scream 80’s, combined with a title screen that anyone that read/played those old choose-your-own-adventure books will just love. Stranger Things has a complete season available for streaming on Netflix, but definitely leaves things open for that (as of yet, unconfirmed) second season. Just like the good ol’ horror movies.